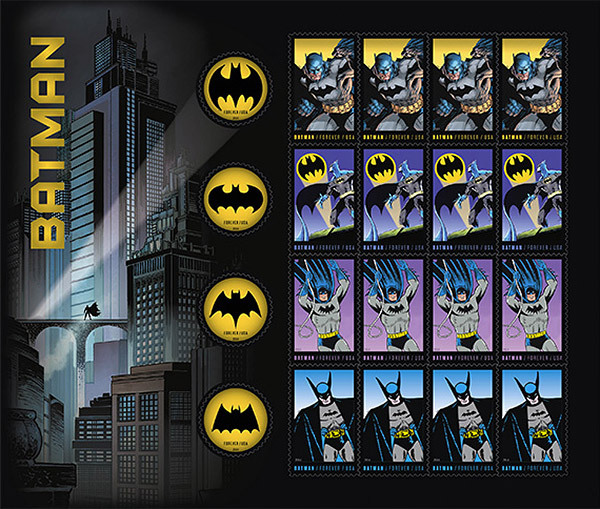 Home » about:art » There Are Batman Stamps! Go get them. They are at your local post office (providing you live in the U.S.). You can use them on all the letters you no longer mail. Or, I don’t know, you send cards to people once in a while still, don’t you? Or, what the hell? Just use them like stickers! Seriously, these were released to celebrate the 75th anniversary of Batman. They depict four different Batmans — early, cheesebally, normal and roided-out. The original Batman is still pretty badass.